A deadly banana fungus has spread across Southeast Asia, the Middle East and Australia. Is Latin America next? The banana is under attack. A fungus called Fusarium wilt is infecting banana plantations in Southeast Asia, the Middle East, Australia, and the blight has even been discovered in Southern Africa in Mozambique. Researchers believe it is a just a matter of time until this disease reaches Latin America, the source of almost every banana consumed in the U.S. If the fungus does arrive, banana lovers may be left with an uncomfortable choice: switch to costlier varieties that look and taste different than the clones they’re used to or choose a fungus-resistant genetically engineered fruit that is still years away from being commercially available, if it ever arrives. International banana companies have been relatively tight-lipped when discussing the spread of TR4. Back in 2013, Chiquita did not seem perturbed: “It’s certainly not an immediate threat to banana production in Latin America,” Chiquita spokesman Ed Lloyd told the Charlotte Business Journal. “This is something that this industry has dealt with for decades.” Dole was only slightly more responsive. The company is using breeding techniques to develop a TR4-resistant banana, said William Goldfield, Dole’s director of corporate communications, in an email with The Washington Post last year, but he did not go into specifics. While these large corporations may not express their concern publicly, they are eager to find a resistant alternative, according to journalist Dan Koeppel, who wrote a book about the banana’s history and the looming threat of TR4. The problem is, these companies already tried that approach decades ago. “They were already blown of the water once by monoculture,” Koeppel says, “and it’s about to happen again.” Another strain of this same fungus devastated single-crop banana plantations in the mid-1900s. 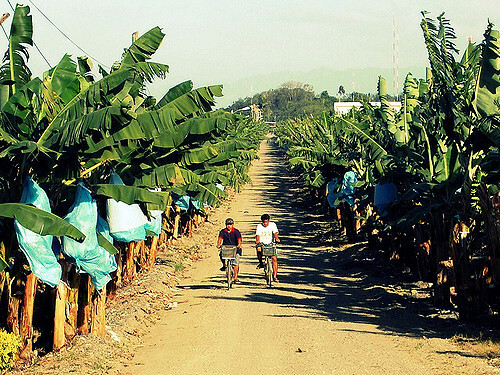 The earlier iteration of the fungus, called Race 1, spread from Panama across Latin America, and the banana trade was only saved by switching to a variety resistant to the disease: the Cavendish. Today, plantations are just as vulnerable to the new strain, but we do not yet have a viable alternative to the currently dominant variety Americans know and love. The issue goes beyond getting your daily dose of potassium: the Cavendish now makes up 99 percent of the bananas Americans consume and 47 percent of worldwide banana production. In 2016, the Food and Agriculture Organization of the United Nations valued the global banana trade at over $8 billion. But this booming industry has already been hit hard by the fungus; research in 2013 estimated that the economic losses in the worst-affected areas of Indonesia, Taiwan, and Malaysia combined were $388 million per year. And the number of fungus-impacted areas keeps growing, with 100,000 hectares – or 386 square miles – currently affected. This is just one percent of banana plantations worldwide, but the U.N. fears the fungus could spread to one-sixth of all plantations by 2040. Fusarium wilt is difficult to kill because it lives in the soil, among billions of other microbes. Targeting just one is nearly impossible, says Nadia Ordoñez, an Ecuadorian studying the fungus as a graduate student in the Netherlands. The pathogen kills banana trees by invading their roots and clogging up their vascular systems, preventing the plant from transporting water and nutrients upward and eventually starving them to death. The TR4 strain is an adept traveler, migrating across Asia to Africa in a matter of decades. Its incredibly hardy spores can survive extreme temperatures and conditions, and can spread by catching a ride with anyone walking across affected soil. “Something as simple muddy shoes can move this pathogen around,” says Ploetz, the plant pathologist. “It’s a survivor, and it’s really good at moving in seemly innocuous ways. But once it establishes in a plantation, you can’t get rid of it.” TR4’s presence in Australia – a country that prioritizes biosecurity – epitomizes the fungus’ sneaky nature, Ordoñez noted. With no known chemical deterrents or ways to prevent TR4’s spread, Ordoñez believes that the pathogen is bound to reach Latin America. The most viable defense, she says, would be to find a banana resistant to TR4, just like we did in the 1950s in response to the Race 1 strain of fusarium wilt. Before that, the Gros Michel banana reigned supreme. Gros Michel was shorter and fatter than the current Cavendish, and tasted better, at least in Ploetz’s opinion. But when banana plantations in Latin America began experiencing massive crop losses, they switched to the Cavendish, which was immune to Race 1. Cavendish bananas – like all commercial bananas – are essentially clones, meaning there is not significant genetic variability from plant to plant. There are some genetic mutations, called somaclonal variants, that pop up and make certain plants more resistant to TR4, but even these plants are not completely immune, according to Ploetz. Theoretically, breeders could create a new fungal-resistant variety by searching for resistant plants and laboriously cross-breeding them. But because Cavendish bananas are mostly sterile, traditional breeding is cumbersome, requiring thousands of banana bunches to be manually pollinated to get just one seeded fruit, Ploetz explains. And even when breeders successfully create a new banana, Ordoñez says, it can take over 50 years to reach a point where the fruit is ready to sell commercially. Given how rapidly TR4 has spread since its identification in 1989, that may be time we don’t have. If he’s right, this could be a godsend for banana producers. Apart from their susceptibility to TR4, Cavendish bananas are perfect for export: they grow fast and travel well, without much bruising. Ploetz asserts, however, that Dale’s modified Cavendish does not produce as abundantly as the original. Dale refutes this. “That is one of the things that people have put out – not that they know,” Dale responded, saying that in general, his bananas perform on par with traditional Cavendish. But even if Dale’s engineered Cavendishes thrive in the field tests, it’s uncertain whether they would be accepted by consumers. Nearly 40 percent of Americans believe that genetically modified food is worse for your health than conventional food, according to a 2016 survey. The stigma against GMOs is even stronger outside America: 19 countries in the European Union voted in 2015 to ban growing GMO-crops in their fields. Koeppel, for one, predicts an engineered banana would not be widely accepted. And even if the GMO bananas can be developed and introduced into the marketplace, it wouldn’t solve the fundamental problem with banana plantations, Koeppel says: they are a classic monoculture, dominated by a single cloned variety mass-produced for export. The lack of genetic variation means that the Cavendish will always be vulnerable to the next strain of Fusarium, or some other banana disease, that comes along. A smarter and more economically viable choice, he says, would be for plantations to grow many variants of the fruit. For example, red, apple, and ladyfinger bananas are popular in Central America and Southeast Asia, but have not received much exposure in the global market. While the distribution system will need to be altered to fit ripening characteristics of particular bananas, it’s an achievable challenge, Koeppel says. Bananas companies have already changed their export system to accommodate the switch from Gros Michel to Cavendish bananas. It may also be in the companies’ best interest, Koeppel noted, because when you expand beyond a commodity product you can also charge higher prices for rarer varieties of bananas.